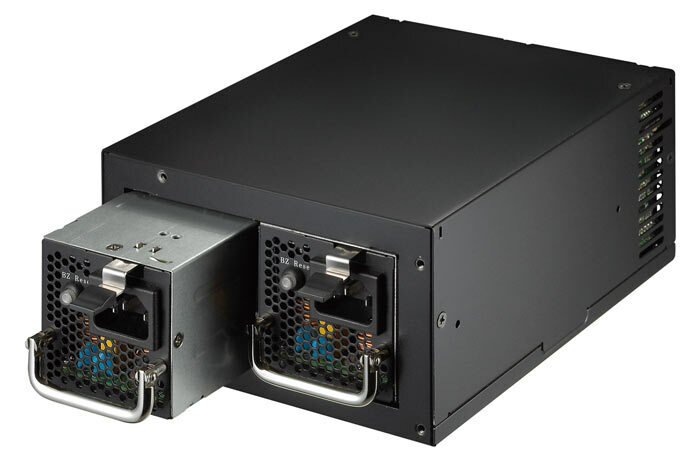 FSP has launched its new Twins Series of PSUs. As indicated by the name, these PSUs contain dual hot-swappable power supply modules. They are said to be ideal for startup companies' web servers, mail servers, or home servers where you wish to benefit from the security of two independent PSU modules in one. Furthermore the Twins PSUs allow such users to avoid upgrading to more costly PC form factors. The two models from the Twins Series differ only in wattage output. As indicated by their model names they are 500W and 700W rated units. Each PSU contains two independent power modules with its own power adaptor. In normal operation the Twins share the load between their two modules (for maximum efficiency and stability) but should one fail "the other automatically takes over as a clean fail safe". Thanks to the hot-swap functionality you can then easily swap the dud PSU module without any downtime. FSP makes it easy to determine which, if any, PSU module fails. The LED Alarm Guard and control software alerts users to PSU problems. If a module fails its LED will flash in red to indicate which unit needs replacing and an alarm sound will make you aware of this issue. A PSU module with a flashing green LED is working fine, and a flashing yellow LED indicates a problem. Twins connect to a system USB header to work with the FSP Guardian software to monitor and control your PSU modules. Users can see input, output, efficiency, and other metrics in real time, or review up to seven days of past data. The PSUs are digitally controlled and provide low noise and ripple. They are rated for 24 hour operation even in environments as warm as 50°C. OCP, OVP, SCP, and FFP protections are implemented. As indicated in the intro, the ATX PC chassis you currently own is OK for equipping with an FSP Twins PSU. There are both ATX 12V and EPS 12V connectors provided for maximum motherboard compatibility. Flat ribbon cables are provided to power other system components. The "remarkable power density" on offer doesn't sacrifice efficiency. These PSUs are 230V 80PLUS Gold certified with 90 per cent peak efficiency at 50 per cent load. The Twins 500W model is said to be available now with the Twins 700W model coming soon. 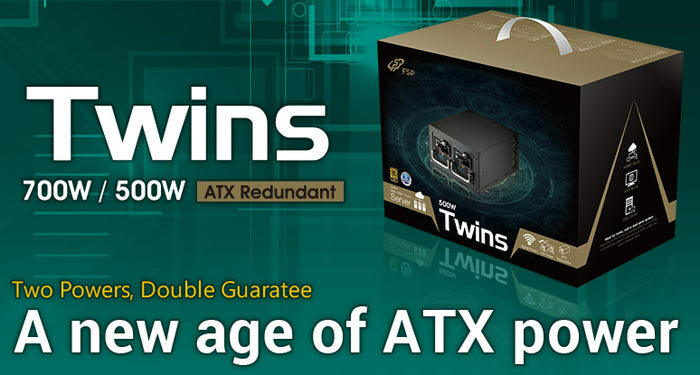 These Twins PSUs have MSRPs of $399 and $499 respectively. Buyers receive a 5-year warranty. I like the idea of this, but that's some serious cash for a domestic environment. Not sure they'd be popular for ‘domestic’ use, at least not at that price and only a 5-year warranty. You could buy a ‘decent’ PSU for less money, probably no less reliable and with a better warranty!? They also make a vast number of OEM and industrial PSUs that run without hiccup for many years. One particular line, made to one particular customer's specfications, says nothing about the company as a whole. I've used FSP PSUs in a variety of builds and have never had any issues with them. But seriously though, you're absolutely right in what you've said and no doubt most hexus users are aware of the need/benefit of a redundant hot-swap PSU, that's a no brainer. But you gotta admit, that ‘pretty software’ it comes with would definitely suggest they're trying to target ‘general consumers’, to which I say, meh (for the reasons I already stated). Yes, Corsair buy/order (make would be too strong a word) plenty of low quality PSUs especially these days (they started out selling mostly Seasonic-made ones in the beginning).